As the releases inch few days closer to 1948 they also move a few honks, squeals and screeches closer to musical anarchy. Welcome to the party, Earl Bostic. So glad you could make it. Looking back some seventy years into the past as this is being written, in order that we may start to look forward at the evolution of rock ‘n’ roll, is a rather strange sensation. We KNOW more or less what’s around the corner. Even those who are encountering this particular era of rock and these specific artists and records for the very first time must at least be conscious of some major rock milestone that lies over the horizon, even if that something is still quite a ways off. So if your point of reference for becoming acquainted with rock music is the mid-50’s, late 60’s, early 80’s, or just last summer for that matter, you’re at least aware that changes in what’s popular are looming. But that’s the fun of it too, especially in retracing that timeline from the very beginning. That was the whole point of this blog after all. To tell rock’s story as a WHOLE, chapter by chapter if you will, using each record covered – and there will be (hopefully) hundreds of thousands of chapters/records that will be reviewed chronologically by the time we get to reviewing 2016/17’s rock releases by Beyoncé, LCD Soundsystem and Chance The Rapper – to paint the bigger picture of how the genre developed and evolved over time. So when we come to these types of moments, the initial sightings of an emerging style that, thanks to our perspective in the present, we know will come to shape and dominate rock music for awhile, be it for just a few months or as long as a few years, I hope that it’s fully appreciated as to just how important those moments really are. For at the time a record like this came out nobody involved had the slightest idea what its ultimate impact would be. Thus if someone had arbitrarily decided against putting it out at that exact moment in history it’s startling to think of how different rock ‘n’ roll might’ve turned out. A few reviews back we covered Paul Williams’s instrumental Hastings Street Bounce, a mildly rousing sax workout which got the ball rolling in terms of kicking off the trend towards utilizing that instrument as a featured component in the rock field. Being first definitely counts for a lot and so Williams is deserving of a good deal of credit not just for introducing the rock instrumental via that recording, but topping it commercially around the corner with his next release, Thirty-Five Thirty (shhh, pretend you didn’t read that and act surprised when we get to it) and thus establishing it as a commercially viable sound, leading in short order to many more of the same. But stylistically it wasn’t those songs which changed the overall approach to sax instrumentals that would come to dominate the rock landscape for the next 15 months or so as much as 845 Stomp did. For while Williams maintained a steady melodic groove, largely resisting producer Teddy Reig’s urging him to honk, Earl Bostic, though equally refined a player as Williams in his heart of hearts, as well as even more technically proficient, did what Williams would not and that was to hold absolutely nothing back. With that fateful decision rock music took another huge leap forward. It’s necessary to at least take a brief pause for those who have landed here without much background in this era of music and are looking to Spontaneous Lunacy to be sort of a one-stop educational center for rock history. (In which case, by the way, Good job, you made a smart choice!) For the rest of you who have already been obsessed with musical history for quite some time this section will no doubt be redundant and if not insulting your intelligence at least will try your patience, so feel free to skip the brief recap of the manic sax style found in the next few paragraphs and join us about 275 words down the road. The single most influential sax-led record in the pre-rock era was released in 1942 when Lionel Hampton, a brilliant bandleader and vibraphonist, recorded a song called Flying Home. He’d already cut the song twice before, first in 1939 while he and legendary guitarist Charlie Christian were in a band led by Benny Goodman. A year later Hampton cut it under his own name featuring saxophonist Budd Johnson taking Christian’s guitar solo spot. That changed the arrangement notably but not yet the accepted standards of the instrument itself. Two years went by before Hampton recorded it yet again, only this time the band now included a 19 year old tenor saxophonist named Illionois Jacquet. The arrangement in this version allowed room for him to improvise and he was actively encouraged to do so by Marshall Royal, who sort of acted as the go-between for musicians and leader in Hamp’s outfit, presciently telling the cocksure young saxophonist, “Go for yourself, man”. Though his solo sounds somewhat mild today, heck, even by the time we’re at now in late 1947 it had been surpassed by increasingly rambunctious horn players, when it came out back in ’42 and people heard Jacquet blowing the same honking note eleven times in a row at two different points during the proceedings it blew their minds. To the musical establishment, the kind who expected refinement, decorum and modesty at all times in musicians, this brazen display of showmanship was seen as almost sacrilegious. But to an entire generation of sax players who followed in his wake it was an open invitation to stretch out more and forcibly pull the spotlight onto themselves. 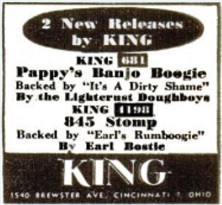 The more flamboyant style that Jacquet pioneered found its rightful home in rock ‘n’ roll five and a half years later when Earl Bostic punched the time clock and cut 845 Stomp, setting the standard for first instrumental craze the nascent genre would feature, taking things far beyond what Illinois Jacquet ever dared dream possible. The idea behind this type of song was simply to whip the crowd into a frenzy by doing increasingly difficult and showy things with the instrument, reaching down for offensive wind-breaking lows and especially soaring for helium-filled highs, preferably as many as possible while playing as fast as possible until either the sax player passed out or pandemonium set in. It was crude, undignified, sensationalistic and generally considered by most serious musicians, foremost among them many of the sax players themselves, to be beneath them to have to resort to doing such tawdry things. Did it ever! In live venues it sold them to a demanding audience, particularly at the chitlin’ circuit venues where restless crowds paid good money to have a good time, not to sit and be politely entertained by impeccably played arrangements. But it also began to sell their records far more than “good music” ever had, as these frantic workouts came closest to replicating that live feeling rock audiences craved. Once rock ‘n’ roll came into being with its emphasis on excitement and musical freedom the sax was poised to take advantage of it, for few instruments in the late 40’s offered the dynamic possibilities to wildly improvise and stir up passions as the saxophone did. Consequently those like Bostic, who may previously have been content to simply close out his live set with such a shameless display to get the crowd on its feet and appease the masses, suddenly found themselves being asked to do the same in the studio to sell the record once this style proved to have boundless commercial potential. What prompted Bostic to do it the first time out, before such sounds had a track record to go on in the budding rock style, is anyone’s guess. But blow he did, turning his alto sax into something that later was largely confined to tenor and even some baritones. In a nutshell, he made it sound dirty. Obscene. Vulgar. Not a single word was spoken, not a lyric was found anywhere and even the title didn’t hint at any impropriety, but Bostic seemed to be using the horn to shout a string of profanities that would make the devil himself blush with embarrassment. Almost from the word go he unleashes a series of squeals and honks with increasing fervor until unsuspecting listeners may have been considering calling in the cops on him, or at least the fire department to hose down this torrid performance. The acrobatics peak early with a high-pitched dog-whistle-esque sustained squeal starting at 42 seconds in which lasts an ungodly 14 seconds without cease – a virtuoso display of breath control that leaves even the listener light-headed and woozy. That it actually goes on from there, for another 1:39 no less, with Bostic amazingly the only horn heard on the entire track (it was just a four piece band, with piano, bass and drums joining him, though it sounds much fuller thanks to his relentless attack), only went to show that this rock ‘n’ roll music wasn’t safe for decent respectable folks who shuddered at such shamelessly raunchy musical orgies. It’s impossible to sit still for this and while some admittedly might be fleeing for their lives out the back door when he launches into the hell-raising histrionics, most would be scrambling onto the dance floor to commit lewd and possibly illegal acts with whomever they could corral. King Records quickly picked this, and other Bostic cuts, up for distribution from the smaller Gotham Records and soon would entice Bostic to jump ship to their label where he’d become the most prodigious, and reputedly best selling, instrumentalist of 50’s rock. With this the floodgates had opened and there was no holding back the onrushing tide any longer. Music would never sound quite so innocent again. Critics of rock ‘n’ roll, both at the time and ever since, loudly proclaimed that this music was gaudy and sensationalistic, intentionally low-brow and meant to appeal to the more base instincts of its audience. Well, guilty as charged I suppose. It IS often cheap and crude by design, striving to titillate rather than elevate the consciousness. What they missed though – or chose to deny – was the fact that there’s an entirely valid need in people to celebrate that more primitive mindset that exists in everybody, even if it’s buried deeper in some than in others. Every so often it needs to be let loose, even just momentarily, so it doesn’t build up and overwhelm people denied of an outlet for it. Instead of getting upset at all this noise and wondering what the world coming to, the uptight critics of this type of temporary emotional abandonment should’ve torn off their clothes and dove into the mosh pit with everybody else and not worried about the repercussions until they needed to call home the next day to ask someone to bail them out of jail. Leave a reply on "Earl Bostic: “845 Stomp”"